In 1993 Senat-Bar opened its doors to a clientele of foreign executives and new Russians eager to enjoy fine food and a sophisticated bar. The fact that both the restaurant and bar remain open until 3 am only increased its attraction. Now well established, Senat-Bar continues to deserve its reputation as one of St. Petersburg’s finer restaurants. Adjacent to Senate Square — with the Bronze Horseman, St. Isaac’s Cathedral and the Admiralty, and the Neva Embankment — Senat-Bar is ideally located in the city’s major tourist and commercial zone. The basement of the historic Senate Building housed the Imperial Archive prior to the 1917 Revolution. A complete renovation of the area in 1993 created a large dining area (seating 80) and kitchen plus a bar area and public facilities, including a convenient currency exchange office. Entering from a foyer-reception area, guest immediately recognize the attention to detail involved in the renovation. The vaulted ceilings are a showcase of reproduction Empire and Post-Modern murals and the furnishings and fittings create a modern spa-jcious atmosphere. 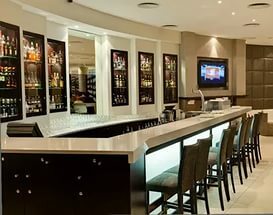 The bar is popular with business executives relaxing after work or enjoying a few predinner drinks. The drinks menu includes over 15 Dutch and international boutique beers, and one of the most comprehensive wine lists in the city, as well as specialty cocktails. Through the bar area is the rather large restaurant where European cuisine is artistically presented by a friendly and professional waiting staff. The atmosphere is both sophisticated and relaxed, well-suited to business dinners of six or eight guests in the larger dining room and intimate dining for two in the second room.